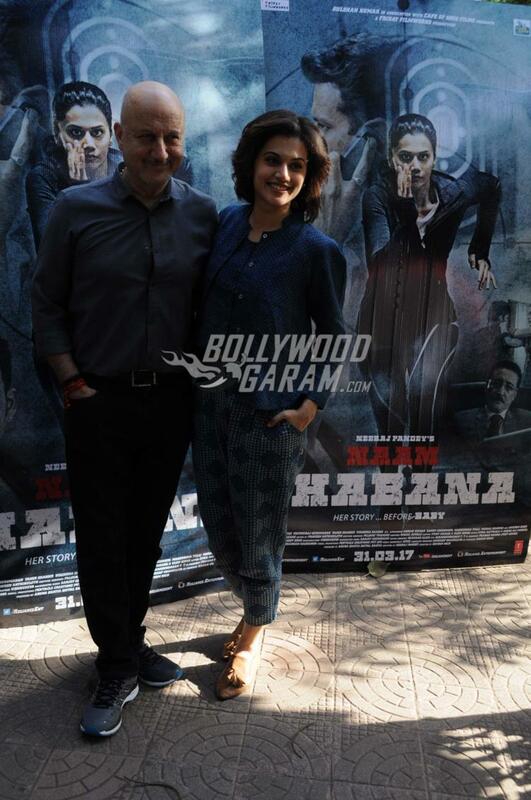 Talented Bollywood actors Anupam Kher and Taapsee Pannu promoted their upcoming movie Naam Shabana together at an event held in Mumbai on March 8, 2017. Taapsee looked fresh-faced in a blue outfit and debuted a new short haircut, probably preparing for the upcoming hot Indian summer. 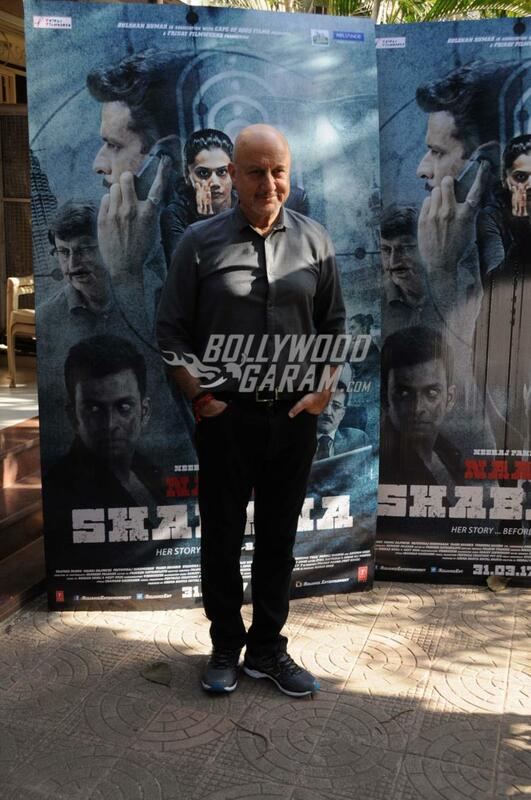 The legendary Anupam Kher donned a grey short-sleeved shirt and a pair of black trousers. 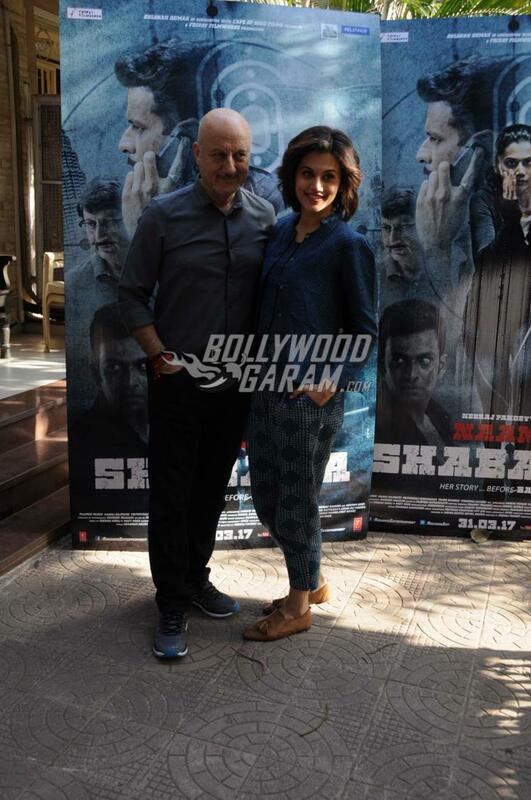 Anupam Kher and Taapsee Pannu had previously shared screen space as co-stars for Baby, which is the prequel to their upcoming flick. Naam Shabana is the name of the sequel and includes a stellar cast lined up – Prithviraj Sukamaran, Manoj Bajpayee, Danny Denzongpa, Madhurima Tuli and Elli Avram, with Akshay Kumar in a cameo role. Taapsee impressed audiences and critics alike with her action sequences in Baby and will now be seen in the lead role in the upcoming Naam Shabana. The multi-talented actress even trained in mixed martial arts and Judo for the role she will be playing in the movie. She had previously acted opposite the legendary Amitabh Bachchan in Pink and will now be seen with another legend, Anupam Kher. Akshay Kumar and Taapsee Pannu had recently put up a joint video on self-defence, ahead of International Women’s Day. In the video, the actress teaches how to incapacitate and fight back, should a predator attack a woman victim. Since the release, the video has gone viral with many women thanking the actress for raising awareness in such a practical way. Naam Shabana is directed by Shivam Nair and is produced by Neeraj Pandey and Shital Bhatia. The action-packed movie will be releasing on March 31, 2017. Next articleShort Film Peanut Butter Featuring Gauhar Khan Proves That There's Nothing Women Can't Do!